10 Amp, four pins. 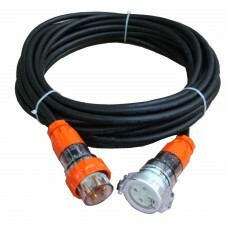 Light Industrial Extension Leads. The 4 Pin 10 Amp “light” 3 phase extension lead is suitable for infrequent short duration indoor use. The “light” extension lead has the shortest maximum length allowed from the outlet to the appliance.